In addition to entering formulas that perform basic math — such as adding, subtracting, multiplying, and dividing — you can use a vast library of built-in worksheet functions in Microsoft Excel to do much more. Finding the number of characters in a cell. Manipulating text; for example, converting "hello" to "Hello" or even "HELLO." Testing the contents of two cells to see which is larger or if they are identical. In a cell, type the equal sign (=) and then type a letter, such as "a," to see a list of available functions. Use the down arrow key to scroll down through the list. As you scroll through the list, you'll see a ScreenTip (a brief description) for each function. For example, the ScreenTip for the ABS function is "Returns the absolute value of a number, a number without its sign." In the list, double-click the function that you want to use. Excel enters the function name in the cell, followed by an opening parenthesis; for example, =SUM(. Enter one or more arguments after the opening parenthesis, if necessary. An argument is a piece of information that the function uses. Excel shows you what type of information you should enter as an argument. Sometimes it's a number, sometimes it's text, and sometimes it's a reference to another cell. For example, the ABS function requires one number as its argument. 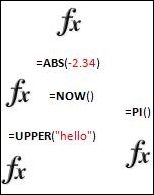 The UPPER function (which converts any lowercase text to uppercase text) requires one string of text as its argument. The PI function requires no arguments, because it simply returns the value of pi (3.14159...). Excel adds the closing parenthesis for you, and the cell shows the result of the function that you used in the formula. Select the cell and look at the formula bar to view the formula. Try creating formulas that use nested functions; that is, a formula that uses one function and then uses the result of that in another function. Try using some functions that you've never used before and see if they return the values you expect.